The Spain national football team represents Spain in men's International association football and is controlled by the Royal Spanish Football Federation, the governing body for football in Spain. The current head coach is Julen Lopetegui after Vicente del Bosque stepped down following Euro 2016. The Spanish side is commonly referred to as La Roja , La Furia Roja , La Furia Española or simply La Furia . Spain became a member of FIFA in 1904 even though the Spanish Football Federation was first established in 1909. Spain's national team debuted in 1920. Since then, the Spanish national team has participated in a total of 14 of 20 FIFA World Cups and 10 of 15 UEFA European Championships. Spain are one of eight national teams to have been crowned FIFA World Cup champions, having won the 2010 tournament in South Africa, defeating the Netherlands 1–0 to become the first European team to win the title outside Europe as well as having won back-to-back European titles in Euro 2008 and Euro 2012, defeating Germany and Italy in the respective finals. These three successive titles make them the only national team so far with three consecutive wins of either the applicable continental championship or the World Cup. From 2008 to 2013, a six-year span, the national team won FIFA Team of the Year, the second-most of any nation, behind only Brazil. Between November 2006 and June 2009, Spain went undefeated for a record-equalling 35 consecutive matches before their upset loss to the United States, a record shared with Brazil. 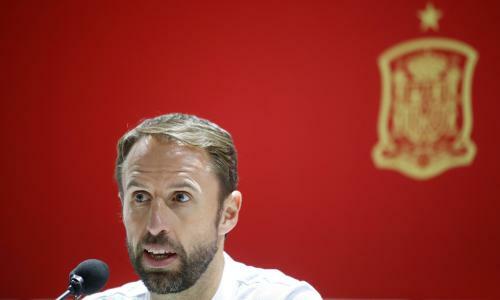 The team's achievements have led many commentators, experts and former players to consider the 2010 and 2012 Spanish sides among the best ever international sides in world football. The first Spain national football team was constituted in 1920, with the main objective of finding a team that would represent Spain at the Summer Olympics held in Belgium in that same year. Spain made their debut at the tournament on 28 August 1920 against Denmark, silver medalists at the last two Olympic tournaments. The Spanish managed to win that match by a scoreline of 1–0, eventually finishing with the silver medal. Spain qualified for their first FIFA World Cup in 1934, defeating Brazil in their first game and losing in a replay to the hosts and eventual champions Italy in the quarter-finals. The Spanish Civil War and World War II prevented Spain from playing any competitive matches between the 1934 World Cup and the 1950 edition's qualifiers. At the 1950 finals in Brazil, they topped their group to progress to the final round, then finished in fourth place. 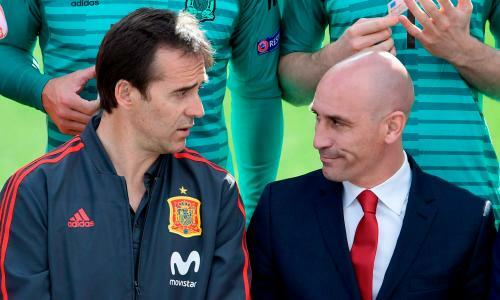 Until 2010, this had been Spain's highest finish in a FIFA World Cup finals, which had given them the name of the 'underachievers'. Javier Clemente was appointed as Spain's coach in 1992, leading them to the quarter-finals of the 1994 World Cup. The match became controversial when Italian defender Mauro Tassotti struck Luis Enrique with his elbow inside Spain's penalty area, causing Luis Enrique to bleed profusely from his nose and mouth, but he foul was not noticed nor sanctioned by referee Sándor Puhl. Had the official acknowledged the foul, Spain would have merited a penalty kick. In the 2002 World Cup, Spain won its three group play matches, then defeated the Republic of Ireland on penalties in the second round. They faced co-hosts South Korea in the quarter-finals, losing in a shootout after having two goals called back for alleged infractions during regular and extra time. World Cup champions parade, celebrate as they pass in front of the Air Force Headquarters in Madrid. At UEFA Euro 2008, Spain won all their games in Group D. Italy were the opponents in the quarter-final match, which Spain won 4–2 on penalties. They then met Russia again in the semi-final, beating them 3–0. In the final, Spain defeated Germany 1–0, with Fernando Torres scoring the only goal of the game. This was Spain's first major title since the 1964 European Championship. Xavi was awarded the player of the tournament. In the 2010 World Cup, Spain advanced to the final for the first time ever by defeating Germany 1–0. In the decisive match against the Netherlands, Andrés Iniesta scored the match's only goal, coming in extra time. Spain became the third team to win a World Cup outside their own continent, and the first European team to do so. Goalkeeper Iker Casillas won the golden glove for only conceding two goals during the tournament, while David Villa won the bronze ball and silver boot, tied for top scorer of the tournament.